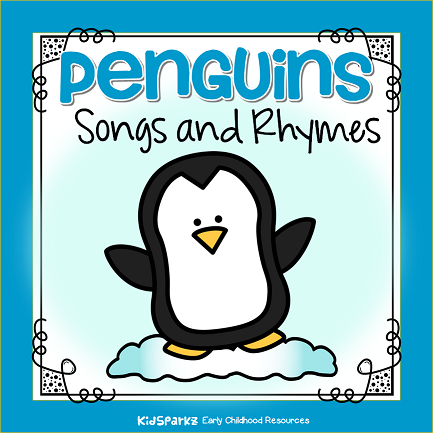 Penguins songs and rhymes for your preschool, prek and Kindergarten teaching and learning plans. Two little penguins sitting on the ice. One bows once, the other bows twice. Waddle little penguins, waddle away. Come back penguins, time to play. I can't fly but that's all right. And now it time for me to go. I'm a chubby penguin; aren't I cute? I'm a bird in a penguin suit. My suit has thick feathers, black and white. I can't fly, but I swim all right! I can waddle round on my webbed feet. Fresh fish are what I like to eat. I have lots of fat to keep me warm. My flippers help me swim along. Short ones, fat ones, skinny ones, too. He led the others because he like to slide. I slide on my tummy to and fro. I'm black and white, just look at me. We are Emperor penguins, black and white. Short and wobbly, an interesting sight. So we'll waddle to the water and dive right in! SPLASH! I went to Antarctica and what did I see? A colony of penguins staring at me! I said to them "Hello good fellows"! And I said to them, "Oh no, don't go"! They took a flying leap, and slid down the ice. SPLASH!